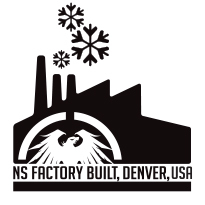 Never Summer Industries has been manufacturing excellence since 1991. Over 20 years of building snowboards by hand, using our exclusive construction methods and innovative designs, has given Never Summer an undisputed reputation as the world’s best. Pioneering technology such as P-Tex side walls and rocker camber profiles together with an industry leading warranty helps NS stand out from the crowd. Find out more about the Never Summer Factory. As well as our own Never Summer Snowboards, we also manufacture for SIMS Snowboards and Academy Snowboards.